In the last two posts, I argued why lean and agile fail as supply chain strategies and why they are inadequate to drive a supply chain design by themselves. The fact is that most of the supply chains need to be lean and agile simultaneously. After all you cant have a lean supply chain that is cost-effective but is unable to react to any changes or an agile chain that is good at responding to changes but simply unsustainable financially. Wal-Mart is a prime example: Their explicitly stated business strategy of low prices has driven them to consistently reduce their cost of operations through supply chain innovations. Wal-Mart’s supply chain is definitely among the most cost-efficient in the industry. However, it is also quite agile. Wal-Mart was the only major retailer to reorient their assortment with national colors and substantially increase their American flag-based merchandise after the 9/11 attacks in a very short time. Absence of any major clearance at their stores also points to an agile supply chain that can adapt itself quickly to changes, thereby avoiding overstocked stores and the need to discount merchandise to clear the shelves. How can a supply chain be both lean and agile at the same time? A firm can regard both lean and agile strategies as process drivers for designing individual supply chain processes rather than as being all-encompassing strategies for developing a supply chain as a whole. In this context, they become the principles that practitioners can use to develop standard processes that leverage one of these attributes even as process exceptions leverages the other. For example, a firm may establish a store-based inventory policy using the lean principle to cover the supply lead-time from the primary warehouse to the store. While the lean design drives their standard replenishment to the store, the process to handle exceptions to manage stock-outs may leverage agile principles, allowing priority replenishments to the store from a set of alternate sources in order to avoid losing substantial sales revenues. The example of Wal-Mart illustrates the complementary use of lean and agile design principles in designing a supply chain that is highly effective – while Wal-Mart uses inventory optimization and transportation optimization processes to reduce the costs (lean), it also uses cross-docking to actively respond to the latest store demand (agile). Therefore, the question of whether a supply chain should be lean or agile becomes rhetorical. Any large enterprise cannot have a rigidly designed supply chain that is either lean or agile. Both of these aspects of lean and agile are required in designing an effective supply chain to support the business. Next, I will present the other two supply chain strategies that are routine mentioned: Postponement and Speculation. I will highlight once again, why they too, fall short of being supply chain strategies and why firms must refresh their thinking on supply chain strategies. Want to know more about supply chains? How they work, what they afford, and how to design one? Check out my books on Supply Chain Management at Amazon . In my last post, I referenced several surveys and reports showing that a large number of companies reduced their spend on technology either through reducing workforce or capital investments during the last couple of years. AMR research showed 51% of the companies surveyed reduced technology headcount as a result of the recession. That raises the question: Is technology expendable? My view is that this is a short-sighted strategy for the companies and would backfire. In the recent years, technology has become like the basic infrastructure that enables all the processes and business functions that firms need to run. In most cases, technology enables their core business models – reducing costs through automation, consistent processes, increased efficiency, reliability, increased accuracy, and so on. Irrespective of the strategy pursued by a firm, it is the underlying technology that enables the capabilities on which the businesses depend for survival and growth. For example, none of the retailers can survive long if their point-of-sale (POS) systems were down for a day, or key warehouses were not able to receive or ship merchandise, or shipments were stranded due to an unavailable EDI gateway that blindsided their planners. The examples can go on. In the online world, the availability and performance requirements for the online retailers on cyber Mondays have become legendary. But technology itself needs to be supported and managed. The fast pace of change of technology makes managing technology a core organizational skill. Managing technology is different from maintaining technology. A lot of firms plan their IT budgets in two categories, (1) budget to keep the lights on, and (2) new capital investments, training of IT resources, upgrades, etc. The focus of the first category is on maintaining the existing infrastructure, renewing software licenses, data center operations, etc. and the second category deals with new planned capital expenses on technology, training, and upgrades. It is generally the second category that gets cut when the times are tough. The fact is that it can be expensive to maintain a skilled IT workforce, ensure that their skills upgrade with the changes in technology, and that the infrastructure does not become obsolete. Businesses depend on technology for their mere survival and existence. The pace of change in technology requires that organizations learn how to manage technology effectively. This includes the technology and skills upgrades. However, firms cutting on technology are only short changing themselves unless they really believe that in some magical future, they will be able to do away with technology completely! Pushing technology upgrades not only makes it more expensive to maintain the existing infrastructure (finding obsolete technology skills is an expensive game), but also makes it prone to failure increasing the risk of business discontinuity. It also reduces the process efficiencies and cost advantages as the competitors upgrade to newer, better technology. In short, it erodes all competitive advantages that the initial investment may have produced and eventually becomes a liability due to increased costs of maintenance, low flexibility, and low efficiency. The only way out is generally a wholesale transplant of new technology which causes huge and unmanageable change in the organization that few firms can deal with. Many readers would recognize the symptoms in their own organizations where the firm implemented a favored technology and then declined to nurture and update it. A decade or two later, the technology dinosaur becomes too expensive to keep, too risky to change, and too inflexible to continue supporting the business requirements of the new times. Solution? Have a technology renewal strategy and be disciplined about continuing investments. Byte-sized (the pun is intentional) change is generally much more manageable than the giga-saurs you will have on your hands without planning. Being absolutely fastidious about where things go, labeling everything clearly, and getting upset when they are missing from their allotted space will quickly get you an obsessive-compulsive disorder diagnosis. But in a warehouse, all this is good, in fact, very good. Item’s physical attributes (length, width, weight, volume, orientation, and co-location constraints). Physical dimensions determine feasibility of the location for stocking the item and co-location constraints determine if the item’s neighbors will play well with it. Item’s handling attributes determine how this item will be moved to this location and later picked for shipping. Does it need a forklift, a hand-truck, or simply a cart? Can a person handle it without physical strain or does it require some kind of lifting assistance? These attributes also limit the number of locations that are suitable for the item under consideration and help determine where it will stay in the warehouse. Item’s demand attributes, like the volume and velocity of demand also affect the best storage locations for the item. High velocity items are desirable to be kept in most accessible locations and so on. But having a location defined for all items in the warehouse is simply a start. Change in item demand from season to season, discontinuation of old items and introduction of new items, changes in item packaging, changes in their handling attributes or their co-location constraints, inclusion in promotions or store clearance, and other similar changes affect the optimal item locations. These changes require can result in less-than-optimized item locations over time. As the item locations become suboptimal, they start affecting warehouse operations and efficiency. Slotting applications ensure that item-locations in a warehouse are always optimized for their operations. Slotting is the science of placing the products inside the warehouse. In all warehouses, there are bound to be locations that are closer to the receiving or shipping docks, convenient to access or easier to reach. As the number of such locations is relatively fixed, it would make sense to utilize them for products with the highest velocities or manual touch points. Slotting applications determine the best placement of products in the warehouse based on different product attributes mentioned earlier. Slotting applications can continuously slot the warehouse so that the routine warehouse activities of receiving, putting-away, picking, and shipping continuously result into an optimally slotted warehouse as the demand patterns change. Alternately, slotting can be run at pre-determined intervals or when seasons or demand patterns change. These slotting runs will then produce a new set of optimized item locations and a set of warehouse move tasks to execute. Some of the applications are capable of doing a cost-analysis to suggest if the cost of moves is more or less than the expected efficiency gains. Slotting not only helps maintain operational efficiency in the warehouse, it also helps in maximizing the warehouse cube for storage. With emphasis on online retail channels that must cater to individual order fulfillment, slotting provides a substantial opportunity to retailers of all sizes to enhance their warehousing efficiency. For a more complete discussion on warehouse efficiencies, you can read this article. Sears Holdings announced yesterday that it currently plans to release financial results for its fiscal 2009 fourth quarter and full year on February 23, 2010, before the market opens. It will be interesting to see how their year ends. So far though, their performance has been dismal. If you had invested a $100 in Sears in 2005, you would have lost three-quarters of that money by January 2009. The chart below is from SHLD’s form 10-K for the year ending Jan, 2009. Since the merger of Sears with K-mart, Sears Holdings has charted out a plan for the merged retailer that focuses away from their brick-and-mortar stores. 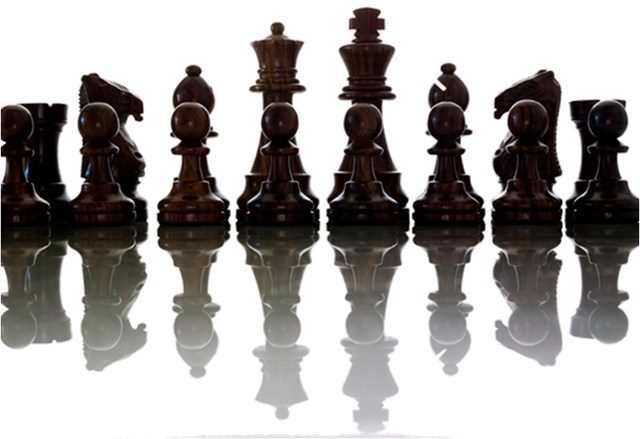 The strategy by itself may not be without merit, however, the planning and execution seems to be poor. There is generally a lot of advantages that a conventional retailer can leverage when shifting their focus to online retailing. In fact, there is much more opportunity in a multi-channel retail environment rather than a single channel for retailers with broad assortments. A multi-channel retailer has the opportunity of presenting multiple ways for the customer to interact with them with each interaction having the potential for a sale. A multi-channel retailer also has the opportunity consolidate all their merchandising and supply chain assets to further reduce their owns costs to serve the end-customer whether that customer chooses to interact through an online, store, catalog, kiosk, or even a multitude of channels for a single interaction. This opportunity is lost for a retailer who is completely online – after all, you can’t buy a Kindle from Amazon and go return at a store if you did not like it. There are definite advantages associated with each of the channels and they can be leveraged through technology enabled processes that allows the customer to have a pleasant cross-channel experience and allows the corporation to spread the costs. This seems to be a point totally lost on SHLD. The reduced investments in the stores have practically choked off customer interest/loyalty in a brand that was build over a very long time. The general message boards are abuzz with unhappy customers – the situation is very similar to the time at The Home Depot when Nardelli took over and cut all investments in stores and drastically reduced the number of associates on the floor in his effort to trim all possible expenses. Sears seems to be following a similar track. SHLD did take a leaf from Wal-mart and has started some amount of customer-facing integration between the online and retail channels, so that the customers can buy online, pick-up at a store, return an online purchase to a store, etc. It would work well if the stores were actually equipped to handle this, which requires adequate systems and people support – otherwise why would you direct your online channel customers to your stores if a pleasant interaction cannot be guaranteed? The reduced investments in the stores are bound to affect the cross-channel customer experience making it a questionable strategy. Second, SHLD investments simply don’t seem to be aligned with their strategy. Unlike the traditional retail, where human interaction can hide a lot of process imperfections, successful online retail depends heavily on well deployed processes. These processes not only substitute the human interaction in most situations, but are also largely responsible for reduced cost overheads through automation and technology. This requires large capital investments. While the customer facing processes like product catalogs, web-based order management are important, the back-end order-fulfillment and execution processes are the ones that can make-or-break an online retail experience for the customer. Finally, the supply chain processes for planning, replenishment, and distribution directly affect the competitiveness and hence the profitability of the operations. All of this requires targeted capital investments in the supply chain and fulfillment technologies. Retail industry, in general, lags in such investments. When you compare SHLD with its usual completion, the picture looks even bleaker: Wal-mart spends close to 1% of its revenues on information technology and Target spends around 1.5%, and it accounts for almost 25% of all their total capital investments into technology. Given their revenues, these numbers are huge and reflect these companies’ commitment in investing in technology as a competitive advantage. While SHLD does not provide specific break-up of their capital investment in technology, assuming that the same 25% of their total capital investments goes into technology, SHLD’s technology investments dwarf to only a ¼% of their revenues. In 2008, these investments look like these: $2.7B for Wal-mart, over a billion dollars for Target, and a paltry $127M for Sears (SHLD 10-K reports total capital investments of $508M without specifying the break-up, we assumed 25% of total was spent on technology, which is in line with the ratio for Wal-mart & Target). This just does not seem to be enough to create a brand-new online force in retail, given the fact that neither Sears not K-mart has ever been a leader in supply chain or merchandising technologies, which means SHLD must start building these capabilities from relatively low levels of capabilities. While their share price has recovered substantially during 2009, partly due to the management’s decision to repurchase $500M of shares, it will be interesting to see how the year closes on February 23 on their revenues (which are still shrinking) and income which were just over 1/10 of a percent in 2008! Want to know about supply chain processes? How they work and what they afford? Check out my book on Enterprise Supply Chain Management at Amazon. You will find every supply chain function described in simple language that makes sense, as well as see its relationship to other functions. In the last post, we presented a quick overview of the push and pull concepts. The first context for the push/pull definitions was the business model strategy where the firm needs to establish how far can it postpone the creation of goods and services to fulfill customer orders. An example in this context is seen in the manufacturing strategy for Dell’s online channel where the computers are assembled only after a firm customer order has been placed. This allows Dell to simply carry the generic sub-assemblies like the HDD, RAM module, motherboard, and so on, and assemble the final customized product to order when an order is placed. This helps in reducing the finished goods inventory that is otherwise subject to obsolescence as the trends for product and demand change. But if you consider Dell’s manufacturing strategy for computers that it sells through retail channels (such as Wal-mart), it must produce and distribute the machines without a firm knowledge of what the customer may demand. This is similar to the conventional “build-to-stock” model. These two examples also exhibit what is known as the postponement or speculation strategy. In the postponement strategy, the firm has the ability to postpone the final assembly of the product to the latest stage possible. The company avoids building finished goods as long as possible but must contend with a short lead-time to fulfill orders and manage demand variability. The company has traded the cost of obsolescence for cost of extra resources by trading inventory for ability to quickly react to demand. In the speculation strategy, the firm builds to stock by estimating demand. The company can build to forecast demand but carries the risk of finished goods obsolescence. Here the cost of obsolescence has been balanced against the increased efficiencies. Of course, these two strategies of postponement and speculation do not lend themselves equally to all types of products and services, therefore constraining the options based on the industry, product, and the targeted customer segments. The second context in which a push/pull concept can be seen is the point in a supply chain where demand is fulfilled through orders on suppliers (replenishment) and beyond which demand is fulfilled through stock (inventory) in the supply chain. For example, consider a typical retail operation. Should the company directly replenish the stores as the stocks on the shelves deplete? Or, should the company replenish the stores from a warehouse that stocks inventory and then replenish its warehouses by placing orders on suppliers? 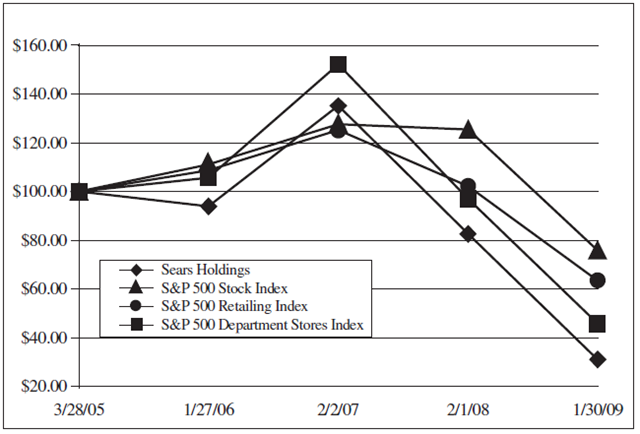 In the first case, when stores are directly replenished by orders placed on the suppliers, the company saves on the warehousing expense altogether, though it may carry higher inventories as it manages several hundred stores, each individually carrying inventories to avoid the risk of stock-outs. In the second case, the company can build a warehouses to optimize inventory to hedge against the stock-out risk, but adds the cost of creating and maintaining a warehouse. In both of these scenarios as well, the company is dealing with balancing the cost of inventory against the cost of resources and fulfillment-time. Therefore, in making the push-pull decisions, companies are primarily balancing the cost of inventory, resources, and fulfillment cycle-time. The factors that generally affect these conditions are as following. While no generic determinations can be made, understanding the concept of balancing these costs and the factors governing them provides an objective method for making such decisions. Demand Variability: When the product demand is certain, stable, and can be forecasted with relatively high accuracy, then a push strategy may work well. But when demand uncertainty is high, consider pull strategies for managing demand. Low demand variability provides an opportunity to create highly efficient manufacturing or distribution processes that may not be very flexible but minimize the cost of unit production. High demand variability works against such efficiencies. Product Variability: The products that are customized and typically require personalization at the consumer level, will do well with a pull strategy for effective demand management. These products are typically branded and consumers place high emphasis on personalization aspects, examples being custom handbags, custom shoes, computers, and even some cars. Some industrial products like rolled steel can fall in this category as well. However, the fulfillment lead-time must be managed to be competitive. When the products are utilitarian, they lend themselves to push strategies for manufacturing as well as supply chains. Economies of Scale: The product characteristics described above generally also describe the economies of scale. With manufacturing based on large economies of scale (and hence no or low customization), push strategies are generally compatible, otherwise consider pull strategies. Manufacturing Setup Changes: When the manufacturing setup changes are expensive and time-consuming, a push-based strategy should be evaluated. Consider pull strategies when setup changes are quick and do not affect the manufacturing efficiencies substantially. Lead-time: Lead-time in this context means the lead-time to fulfill demand. This can be a replenishment, manufacturing, or distribution lead-time or a combination of these, depending on the specific situation. Higher lead-time generally favor push-systems to build inventory so that end-demand can be fulfilled relatively quickly. The push/pull decisions afford a balance between the responsiveness (agility) and cost (lean). Pull systems must be responsive to be effective, push systems are generally more cost effective though they not have the same amount of flexibility as the pull-systems may have. Of course, all systems are generally a combination of the push & pull strategies to be most effective. We will discuss these aspects of push/pull concepts in the next post. Push or pull? That is a question every supply chain needs to answer. 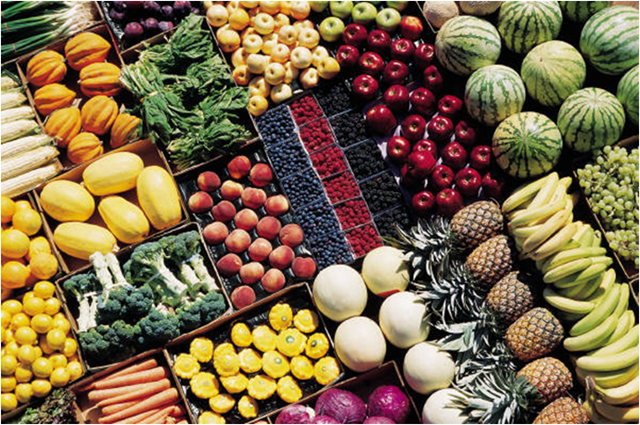 Before you do, it is important to understand what it means & how it affects the supply chains. Understanding what it means depends a whole lot on the context. It also changes the question from push or pull to a question of where should the inflection occur. Looking at an extended supply chain that cuts across individual companies and simply represents the supply chain for a product, the push/pull looks something as shown in the exhibit below. Depending on the number of links in the extended supply chain, the boundary of push and pull processes can be established. Setting up the boundary at 1 represents a fully pull-based supply chain that illustrates that the planning for a product starts when customer places the order and creates firm demand. Moving this all the way to the last link at 4 represents a full push-based supply chain that illustrates that the products are built, distributed, and ready for the customer demand. There are two other intermediate positions 2 and 3 that are possible in this illustration with five distinct nodes. These can represent the intermediate scenarios where the final product may be assembled when the customer order is placed to distribution scenarios where products are ready but distributed or shipped in response to demand. Analyzing the push/pull decisions in this context generally allows the companies to understand how their extended supply chain works and what might work best for them as a business strategy. Of course, this decision is not depends on a lot of other factors such as the attributes of the product & demand itself. For example, detergent is not the likeliest candidate for a pull-based scenario and luxury yachts would probably not fit the bill for a push-based scenario. However, understanding the overall supply-chain and analyzing the product and demand characteristics within that context does help companies understand their options and even opens new segments in an industry that may not have existed till then. Dell is a great example where they identified a niche and developed a pull-based industry supply chain for personal computers where none existed prior to that. The same concept, when seen in the context of a single enterprise supply chain, can be understood more as an inventory-order interface. Supply chains are modeled as a a series of processes that are connected through inventory buffers. Within a retail supply chain, for example, the supply chain can be simply modeled as shown below. In the case of a conventional brick-and-mortar retailer, the positions 1 and 4 will be impractical — after all, they must have products physically available in the stores when the customers walk-in. The inventory-order interface at links 2 and 3 will be perfectly valid as the retailer can either choose to replenish their regional warehouses or their distribution centers or both. In that sense, the processes to the left of points 2 and 3 will represent push-based processes & those to the right will be pull-based. However, in the context of Internet based retail operations, order-inventory interface can move to almost any position. The retailer can choose to fulfill customer orders from the inventories in their own regional warehouses or distribution centers, or, they can choose to fulfill customer orders directly from their suppliers in what is called a drop-ship model. For supply chains, then the question is not push or pull, but rather where in the supply chain should be inflection occur? 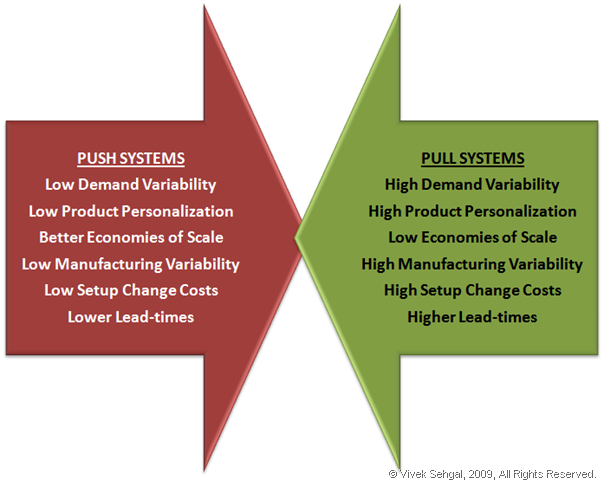 What is the optimal point where the supply chain changes from a push-based supply chain to a pull-based supply chain. All supply chains must be a combination of push and pull processes — purely push or purely pull supply chains exist only in theory (imagine a purely pull-based supply chain that must start prospecting for minerals to make steel to make automobiles after an order is placed!). Deciding where the inventory-order point must be placed is a matter of analyzing much more than just the supply chain operations. The products, market conditions, demand patterns, competitive and other external market pressures must be understood and analyzed to make such a decision. The decision affects the operational costs, response times to fulfill demand, agility (ability to react to changes in demand), as well as flexibility (ability to react to changes in product design or demand location, for example). There are no standard templates, but there are some helpful matrices using the product & demand patterns that aid this decision. We will discuss these matrices in the next article on the subject.